Marshall McLuhan, who was born 100 years ago today (July 21, 1911), authored “the medium is the message” in 1964. He explained that the nature of media influences how messages are received without receivers realizing it. For example, motion pictures require less interpretation by viewers than radio. Digital marketing validates the same point in a completely new way. Current day technologies spawned by the internet allow messages to be fleeting, even expendable, as media platforms test and refine them. Industry observers estimate digital-out-of-home to be roughly where the internet was in the mid-90s. As DOOH media evolve to be more characterized by “digital” than “out-of-home,” are we equipped to let the medium drive the message? The 1960s, the era of McLuhan’s writing, was a pre-clutter age. Good copy could break through because channels were not yet saturated with noise and consumers were not encumbered with tuning out annoyances. Traditional marketing anointed messages as king. Magazine ads are a perfect example. Text-rich pages catered to a patient readership. Copy was conversational, emotion won over promotion, and benefits won over features. 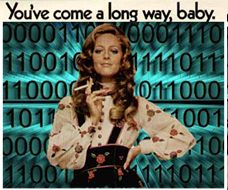 Virginia Slims weren’t thinner cigarettes, they were womens’ liberation embodied. In this decade, ads faced expensive, long lead production. But once the unique selling proposition was expressed in memorable creative, magic happened. Brands built markets and markets drew masses of consumers willing to conform. Net-net, message was marketing. Advertisers could afford heavy up front creative investment because the output worked. Testing was tolerated up front, but the agencies with the “big idea” had the final say and campaigns were let loose to run their life cycle. The age that began in the 90s and continues today has been called the “unbundled” era the “cyber” era and the “audience” era. The biggest change brought on by digital media has been time compression. Both the creative cycle and the feedback loop can now be instant. Access to customer data makes instant personalization possible. Retailers have a special ability to identify customer needs and deliver relevant offers, both through digital channels and direct from store associates. Digital marketing has anointed the medium as king. Marketers can diversify their investment in messages rather than being forced to make big bets. This has yielded a law-like pattern:routine messages channeled intelligently beat intelligent messages channeled routinely. In fact, marketers like Harry Gold of Overdrive challenge planners to abandon the campaign altogether and embrace the channel. Campaigns have points of no return, they either work or they don’t. Channels go on forever, they can be measured, evolved and improved. Singh points out that TV distribution has a long way to go before it can meet the real-time demands. On the other hand, instant distribution (wireless, IPTV, etc.) and instant feedback (mobile engagement, sales response) means DOOH is ready for real-time—if shopper intelligent systems are in place. While medium thinking is embedded in online and mobile, it is just emerging in DOOH. Once you have twin capabilities of instant transmission and instant feedback, you enable dynamic content optimization. A keen understanding of audience mindsets. DS-IQ plans in-store and near-store screen locations based on a knowledge of shopping trip anatomy. The simplicity of messages presented during the half a minute a shopper is at the front of the store contrasts with the depth of content during the 2-3 minutes a shopper views the HD TV wall. When advertisers adopt ‘medium” thinking, DOOH generates higher returns for less risk. DS-IQ is expanding a base of best investment practices through the analysis of thousands of campaigns executed through diverse media assets. McLuhan coined the “global village” and envisioned the World Wide Web almost 30 years before it existed. He wouldn’t recognize marketing today. But his predictions about the reign of medium over message have never been truer than today’s digital era. Amen. Somewhere from on high Marshall McLuhan is gazing down on us, smiling. He was right. Nice pic. Marshall McL + Virginia Slims, baby! IS RETAIL SALES DECLINE A CAUSE FOR PANIC? WILL THE US EMBRACE SINGLES DAY?